If you saw our budget update in February you know that March was a tight month for us. One of the things I really love about living on last month’s income is that we have some time to plan how to handle a month of lower income. As you’ll see in the spending details below, we didn’t fund our sinking funds at all in March. We also didn’t put anything extra toward our mortgage. Well, we did put a teeny tiny bit extra toward the mortgage on accident. I’ll explain that in a minute. Even though we don’t have much to report in our community Debt Smash-athon for March, I bet you do! 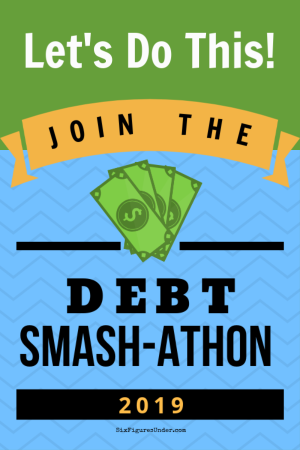 I have the survey up for you to report your March progress, so as soon as you finish reading here, go to the March Debt Smash-athon Report to let us know how you did (and get entered for the monthly prize). Remembr, we’re counting debt paid, contributing toward your retirement, or saving for a big goal! We live on last month’s income. The spending section below shows how in March we spent the income we earned in February. This section shows the money we earned in March and will be spending in April. Blogging Income $827 My blogging income is totally on the low side again this month. Last month the income was fine but I had a lot of expenses. This month, it’s just a low income. I will have some bigger months coming up to offset low months like this, so I’m not worried. Airbnb Income $1,039 Our Airbnb expenses this month included a $300 propane bill. That’s super painful because we are getting rid of the propane next month and replacing the old wall furance in the rental with an electric heating/AC unit. The gas company is actually going to charge us to pump the propane back out of the tank and then another fee to haul the tank away. Other than that drama, Airbnb is going well for us. In case you didn’t see, I published a post recently that goes into detail about our Airbnb start up costs. Each month we budget last month’s income down to zero. This is how we spent the money we earned in February. Tithing- $754— We always pay a 10% tithe on our income. This tithing (like all of our March spending) comes from the money we earned in February. You can read about why we continued paying a 10% tithe even when we were in debt. Mortgage- $3,472 Our monthly mortgage payment went up due to a change in homeowners insurance. Our previous homeowners insurance decided not to renew us because of fire danger (more than one insurance company was hit hard after the Camp Fire in Paradise, CA last year). We chose a new policy that covers short-term rentals so that the Airbnb rental on our property would be covered as well. Our mortgage payment includes homeowners insurance, property taxes, and a little PMI. We have a 15-year mortgage, but our big goal is to pay it off in 5. If you’re a numbers person, or are looking at mortgages yourself, Mike has a number-full description of our mortgage just for you. Electricity- $395 The bill we paid in at the beginning of March mostly covers February’s usage. You can read about one of the reasons it’s through the roof in this Instagram post. Water- $43 Our water bill comes every other month and varies, but we try to set aside half of what we expect the bill to be. Cell Phone (Steph)- $14 Republic Wireless no longer offers my plan to new customers, but you can now get a 1 GB plan for $20/month. That’s pretty sweet too. It’s what Mike has, but it’s a business expense for him, so never shows up here! Actually when you transfer your number to Republic Wireless right now you can get 2 months of service free! I had a reader recently tell me about Mint Mobile. It looks like another really great option for affordable cell phone service, especially if you want to bring your own phone. You can get a data for a lot less than Republic Wireless. Definitely worth looking into if your cell phone bill is through the roof! Food- $398 We’re back to another normal month for food spending. You can see what we spent the first $300 on in March’s monthly grocery haul. Houshold Misc- $166 We bought a second chain for our chainsaw, 250ft of ethernet cable to rewire our internet, a folding wagon , a new spark plug for our riding lawn mower, a potty seat that works well for little boys, and a few less exciting household things. Clothing- $33 Mike found a couple of great pairs of shoes at the thrift store and I found a few clearance items at the store. I used some ThredUp credit that I had, too, which went even further becuase they offered me free shipping as well (not sure if everyone gets the “limited time free shipping” or not, but it’s worth a look!). Animals- $25 We bought two 50 lb bags of chicken feed. Kids’ Activities/School- $67 Field trip and dance shoes. Allowances- $60 We give our kids “practice money” as a weekly allowance. You can read all about why we decided to pay our kids allowance that’s NOT tied to chores, as well as all the details of when and how much in this new blog post. Fun- $0 Don’t worry. We still had lots of free fun in March. The amount in bold is the amount that was added to the fund this month. For March we didn’t add anything to sinking funds, so it’s $0 across the board. Any spending is noted in the comments along with the current balance of each fund. Medical/Dental- $0 This month we paid for a doctor visit, eye exam, new glasses, and crutches. We found great crutches for $6.50 at the thrift store, a savings of 80%! In total we spent $76 this month. Current category balance is $2,001. Car Maintenance- $0 I had an oil change on the van and the mechanic noticed that the tire tread was pretty low, so I headed over to Sam’s Club that day for four new tires. We used a total of $430 from our car maintenance sinking fund. Current category balance is $1,708. Christmas- $0 We spent $0. Current category balance is $190. Life Insurance- $0 We will be sure to make up for missing this payment into our sinking funds in a month where we have extra. Our premiums aren’t due until November, but if we put aside $75 each month we should be able to cover them. Current category balance is $280. Birthdays & Gifts- $0 We spent $0. Current category balance is $164. Car Registration & Smog- $0 We spent $0 from this fund in March. Current category balance is $201. Kids’ 529s $125 — I know that $25 per kid per month invested for college looks piddly, but we’re not as concerned about college costs as a lot of people seem to be. You can read about our decision to start saving a little for college in this post. Sadly, we don’t have an exciting amount of extra mortgage payment to report this month. Our old mortgage payment was just under $3,200, so we had an automatically scheduled additional $17 of principal payment each month to bring the total payment to a nice even $3,200. Our March mortgage payment went up to $3,472 because of an increase in homeowners insurance premiums. I forgot to take off the additional principal amount from auto payment, so we paid a whopping $17.68 of extra principal on our mortgage in March. How did your budget and/or debt repayment go in March!? Not sure if I missed it. Did Mike stop his private practice? Yep. Well, he’s in the process of finishing up (it’s a long process). We decided at the end of last year that he would wind it down. He was just getting too busy with two jobs and a communte (not to mention all he does at home and at church). He really just had to choose between working for the state or doing his private practice full time. He hasn’t been taking any new clients or new matters, but he has older matters that will take some time to finish up. The plan is that when he is totally finished with his private practice we will work together blogging and making videos for Six Figures Under. I’m super excited to work together! He’s awesome! I am hoping that you can explain the expenses that you incur running your blog. It is something I have a strong interest in understanding. You have done such a GREAT job showing how you budget I would love to see how you mange the expenses associated with your blogging!!! !